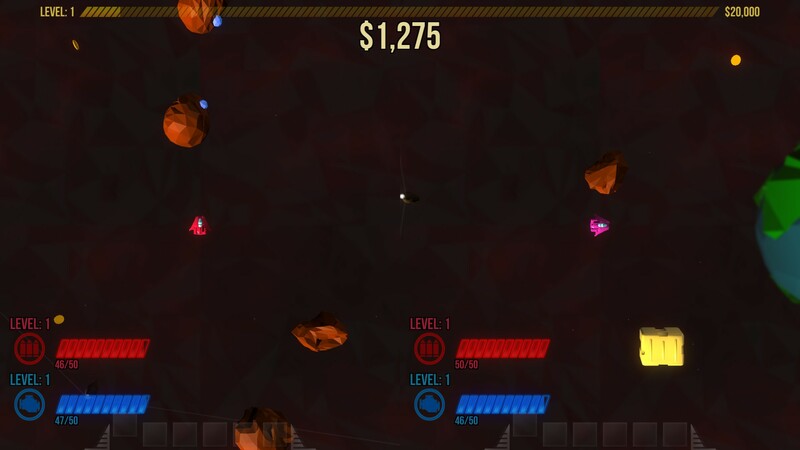 The core mechanic to Cashtronauts is not much different than any other shooter. Fly around, shoot stuff, and get points (or money, in this case). There's a central space hub area that's patrolled by "Tricera-cops" (in this future, dinosaurs rule the galaxy) where you can sell minerals you collect and refuel/restock your ship. Outside of this hub space - which is denoted by a faint line around - there are asteroids with minerals in them that you can blow up to get the goodies inside and space pirates that attack you in attempts to get your hard earned cash. 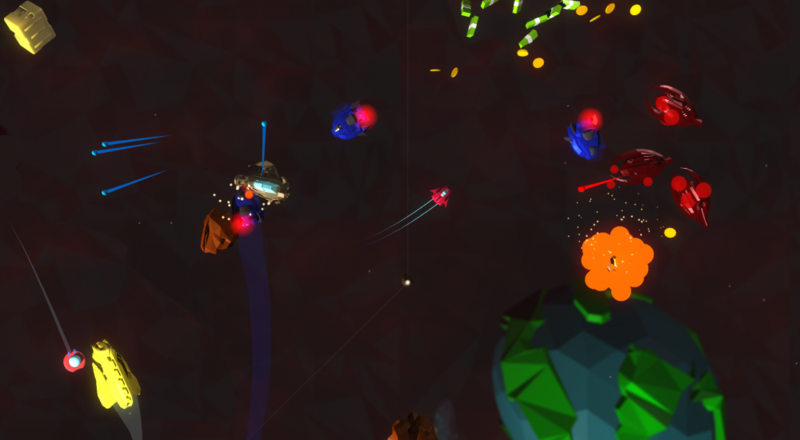 What makes Cashtronauts stand out from shooters is how the core score mechanic is used. Its most important use is to refuel your ship and restock it with ammo. Running out of either is not ideal, obviously, though the good news is that running out of fuel doesn't just leave you stranded in the deep dark of space. You'll still move, just at a much slower pace. Not so bad if you're hanging around the space port; very bad if you're further out and trying to out run some space pirates. It's next use is as a means of escalating the difficult during your session. All cash you've accumulated thus far is shown at the top of the screen and just above that is a bar with a level and a "goal to next level". The level is an indicator to you of how difficult things are getting. Levels 1 and 2 will pass fairly quickly. Level 3 will see increased space pirate activity, while level 4 introduces a new enemy, the Vermin. The average space pirate will stay out of the space port zone (a fairly big space that is patrolled by "Tricera-cops"). Vermin are like honey badgers, they don't care. They'll just fly right in shooting off missiles and making statements about "want shiny!" These guys ruin everybody's day. Finally, all of the money you earn across multiple sessions gets tracked and is used to unlock new "risks." 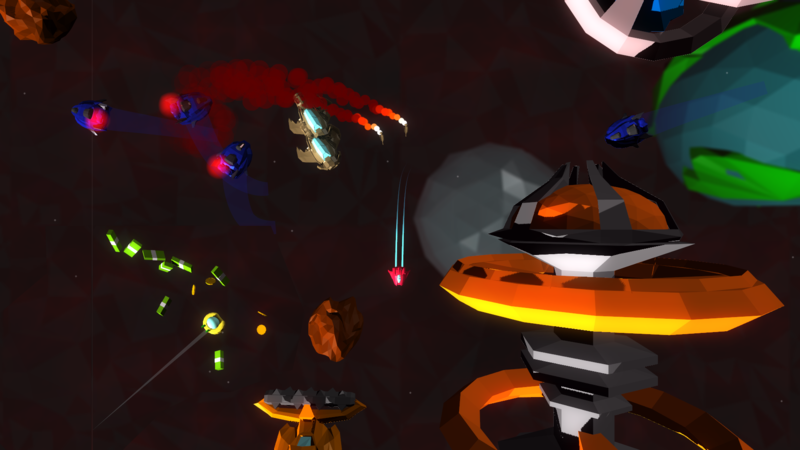 Akin to skulls in Halo multiplayer modes, these affect the game by adding new elements, such as being able to collect teeth from space pirates to sell to the cops, citizens showing up in the space port, and red minerals showing up in asteroids, to name a few. The catch is that each of these come with their own risks. You can blow up citizens for cash but doing so makes you wanted for a brief time so the cops will shoot at you while you're hanging around the space port. The red minerals are worth more than the default blue ones, but they are also illegal so cops will shoot at you if you're carrying them (though they immediately stop caring the moment you sell them). All of this makes Cashtronauts a very interesting (and fun) game to play. There's a fine balance to strike between how aggressive and risky you are with trying to get as much money as possible. Early in a session it makes sense to go far afield to look for things versus later on when hoards of pirates and vermin lay in wait for you to leave. While I haven't unlocked all of the possible risks (15 total), I'm very interested in seeing what else the game will do with this mechanic. There's a lot of room here for the developer to play with the "risks" and level mechanic to create some very weird scenarios for players and/or make it incredibly hard for those seeking a challenge. On the co-op side of things, four player split-screen is supported, provided you have at least three controllers. Each player contributes to the overall total and therefore all players share that money when it comes to spending it on refueling/restocking. Upgrades are earned individually by each player but you can share goods, in a way, by dropping all of your cargo and letting another player pick it up. Should a player die, they will be brought back when the next level is reached. There doesn't appear to be too much else in the way of interactions between players, but having another ship (or two or three) around to help you get all that money is certainly a boon. The only issue I have with the game thus far is the way the damage on your ship works. You can be hit twice before blowing up, which is fine, but more often than not you'll get those two hits at the same time and thereby making the second hit just pointless. When you first get shot, your ship spins a bit and you're temporarily out of control with no way to maneuver or react. This means that if you're being shot at by a pirate or vermin ship, you probably are just dead if you get hit as the shot that's following just behind the first will likely hit. It feels like there needs to be some kind of system in a place (a shield, maybe, or a quick side boost maneuver) to help you get out of these situations. I was a little surprised by how quickly Cashtronauts hooked me. I went into it expecting another twin-stick shooter, and found myself caught in that trap of "just one more session." The game's soundtrack (composed by Patrice Bourgeault, who also did the soundtrack for Mercenary Kings) certainly helped in this with its wonderful space synth/chip tunes melodies. Just listen to the breakdown at the 1:09 mark on the "Space Pirates" track and try not to fall in love with it. There's definitely a solid foundation in place with this title and I look forward to seeing how the game progresses before its final release. Cashtronauts is available via Steam Early Access for $7.99 on Steam. Page created in 1.4462 seconds.